French President Emmanuel Macron is in trouble, and now another Leftist leader almost bit the dust. Teresa May finds herself in the same place as almost all other Leftists European leaders. The people have lost confidence. U.K. Prime Minister Theresa May is fighting to keep her job as members of her Conservative Party seek to oust her in a no-confidence vote Wednesday. May has been unable to shore up support for the draft Brexit deal she negotiated with the European Union. “I will contest that vote with everything I’ve got,” May said outside of No. 10 Downing St. The vote on her leadership will take place from 6 to 8 p.m. local time (1 to 3 p.m. ET). With all eyes now on the U.K. Parliament, there is speculation over what the outcome might bring. You can watch the proceedings in the House of Commons online. In case you wonder who put May on blast, I give you President Donald Trump. Not long ago he ridiculed May’s Brexit strategy. Mr Trump undermined the Prime Minister’s Chequers plan on the next stage of Brexit by warning that a soft exit from the European Union will ‘kill’ any trade deal with the US. Bullied? More like “sound advice” that May ignored at her own peril. And like her French counterpart, May now faces a catastrophe of her own. But don’t let the facts get in the way of Leftist narratives. Because Americans love May. Two-thirds of Americans have a favorable view of British Prime Minister Theresa May. The leader of the British Conservative Party is more popular among Republicans (74%) than among Democrats (65%). Do I really need to tell you have jacked up this poll is? The idea that Republicans side with a woman who is the anti-Trump of Britain falls flatter than your great-grandma’s 90-year old breasts. Was this poll given to 1,000 random users of hallucinogenic drugs? Further, May’s popularity in her own country, Statista has her approval at 34 percent. Frankly, I think that’s being generous. 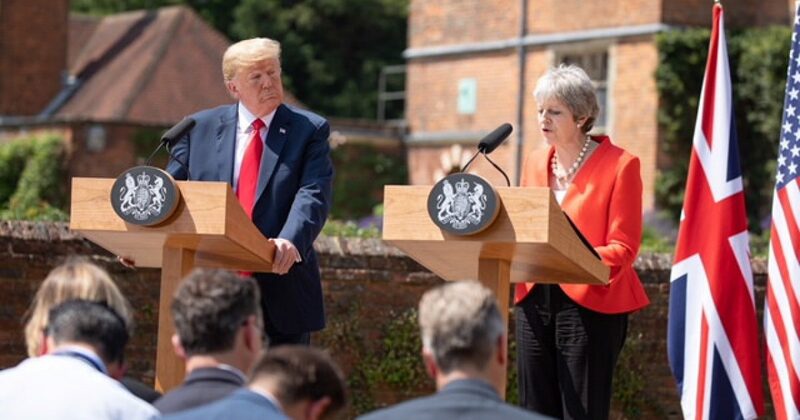 Here’s what I do know: President Donald Trump receives higher approval ratings in Britain than May. The same is true when Trump is compared to Macron in France. So much for Leftism. What the world now experiences is Trumpism. Every America who voted for Trump has been more than vindicated. In France, the Yellow Jackets chanted, “We love Trump!” In Britain, they chanted, “We LOVE Trump!” No polls needed. May survived the vote of “no confidence”. But do you really believe she survived this vote? And how will America’s media cover the fact that European leaders are almost all embattled by their constituents, save Italy’s new PM. And he takes a “Trumpian” approach to dealing with his country’s immigration problem, for example. That’s Trumpian language without a doubt. Further, this is the reason Salvini was elected, and Italy will be better for it. As for May in Britain and Macron in France, until they read the memo from the new sheriff, things won’t improve for them.